Farmer McBroom is a successful farmer who has an evil neighbor, Heck Jones, who has tried to steal his farm several times. McBroom is tricked into betting his farm against his neighbor's farm in a race. McBroom overcomes the trickery to win the race and keep his farm. 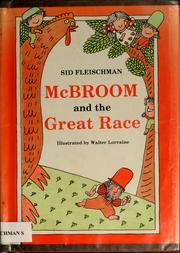 Fleischman, Sid, “McBroom and the great race,” Children's Picture Book Database at Miami University, accessed April 21, 2019, https://dlp.lib.miamioh.edu/picturebook/items/show/6916.